First Direct Arena - LeedsMrs Brown's Boys D'Musical? The O2 - LondonMRS Browns Boys D'musical? The SSE Arena, Belfast - BelfastWest Lounge - Mrs Brown's Boys D'Musical? About Mrs Brown's Boys D'Musical? Mrs. Brown’s Boys D’Musical? promises to take audiences on an exhilarating, side-splitting and musical adventure across a string of UK dates, with both matinee and evening shows across the weekend. Mrs. Brown’s Boys appeared first on Irish radio station RTÉ 2fm in 1992, followed by a series of books written by star O’Carroll from the mid 1990s onwards. 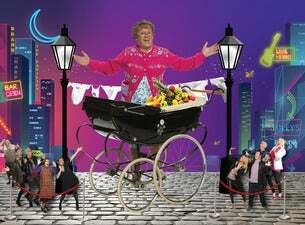 The multiple award-winning television series Mrs. Brown’s Boys launched on the BBC in early 2011, and Mrs. Brown’s Boys D’Movie was released in 2014. In addition to the musical, their BBC One series All Round to Mrs. Brown’s will continue, with record-breaking viewing figures since its launch in 2017, and a third series on the way in 2019.